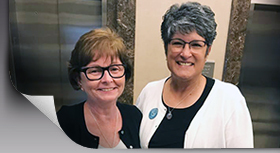 Though the Sisters of the Presentation of Dubuque, Iowa were founded in the Midwest in the Upper Mississippi River Valley, the congregation nurtures its connections with other Presentation congregations worldwide. The Presentation congregations in North America create the Conference of Presentation Sisters. These congregations are connected to international Presentations through the International Presentation Association.